Hello sunshine! Go away, flu! Spike wakes us up with a bark. “What is it, Spike?” I stick my head out from under the quilt while Bridget pretends to sleep. The first thing I notice is the glow on the walls of the Best Little Trailer. Spike’s standing at his sleeping spot at the foot of the bed with his nose to the back window. I sit up, and Spike and I watch the sunrise together. All is calm at our camp in the Ogilby Road dispersed camping area twelve miles west of Yuma, Arizona. The dust storm has passed. “Well, we made it through the night without turning on the heater,” I announce, smiling to myself. 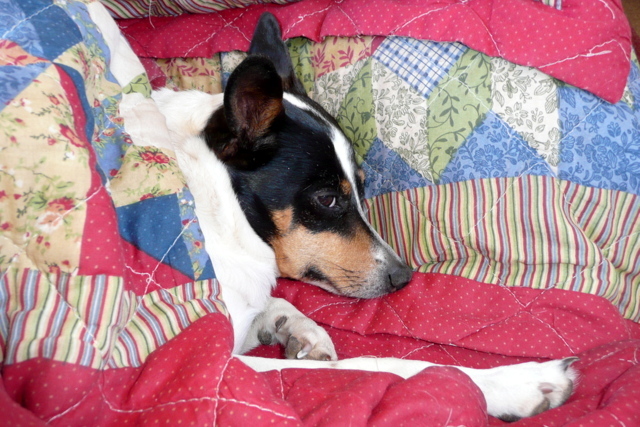 Bridget doesn’t stir, remaining a warm ball under the quilt. It always takes her the longest to get moving in the morning. As for Spike . . . He jumps down and heads for the door. He’s anxious to begin his morning rituals. I notice that yesterday’s winds blew the hummingbird feeder upside down, emptying it. It’s wedged in the branches of our scraggly tree. I take it inside and make another batch of sugar water while the percolator heats up. I spread birdseed on the ground. Then I pick up the stepladder, open it up, and position it alongside the Perfect Tow Vehicle. I get out the solar panel supports, climb up, wipe off the dust, and quickly position the panel at a 40 degree angle. It takes less than a half-minute to put up the panel. I go back inside and fix my coffee and the hummingbird feeder. I pull back the quilt to reveal Bridget’s sleepy face. “Well, hello, little girl. Are you getting up today?” Spike announces that he wants breakfast, and he wants it NOW. And so another day begins for RVSue and her canine crew. Hmm . . . Is that a muscle ache I feel? A little later I notice a tenderness on both sides of my neck. Uh-oh . . . I must have picked up something while at Wally World yesterday. I’d better take it easy today to save my energy so my immune system can fight back. I stay in bed most of the day. I take a Tylenol and then a lozenge at the first cough. I go online, read, watch television, eat, drink lots, and nap. I download several free books to my kindle, including seven Zane Grey novels. At the warmest part of the day I bundle up, go outside, and wash and dry dishes. There’s only a slight, occasional breeze, and the sun feels good, its warmth radiating off the side of the BLT. After a good night’s sleep, kept warm and comfy by my two canine “heaters,” I awake refreshed. Great! No symptoms of the flu! Well, I’m not going to push my luck. I’m staying away from people for as long as I can manage it. Thanks, readers, for the feedback. I made an adjustment that I hope decreases load time for those of you experiencing sluggish loading. Only two posts should appear upon opening my blog. Let me know if that helps. 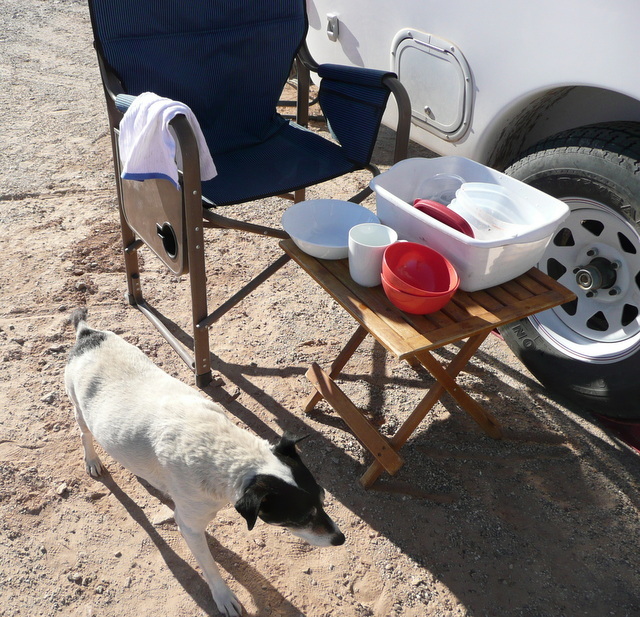 This entry was posted in Simple living and tagged casita, dispersed camping, free ebooks, kindle, Ogilby Road, rat terriers, RVing, solar panel, travel trailer, Yuma. Bookmark the permalink. 83 Responses to Hello sunshine! Go away, flu! You’re right. You shouldn’t have any trouble at all transitioning to full-time vagabonding, what with your camping and full-timing history. You’re also right about wanting a mattress in a bed! To tell the truth, I would not camp in a tent at some of the places I visited last summer, because of bears. Happy you are with us. Thanks for writing! Your home page used to take a 5-10 seconds to load, but today it was instantaneous. South of Chicago, we have had 3 days in the mid 50’s but tonight promises a cool-down. For the next few days highs should be in the upper 20’s. It was strange being warmer here than than you in the southwest! We’ve been in the 50s and 60s here, but I heard AZ is a lot colder. Yeah, what’s going on with Chicago… no snow yet! Darn cold up here in the Mesa area… temps in the low 20s last night (and for the next 3 nights…) and highs in the 40s… YUCK!! Glad you’ve found something that keeps you healthy when colds and flu are going around. I know you’ll be happy when your truck is put back together again! You and Timber stay warm,too! I am also a firm believer in Vit ‘C’. First sign I chug 5 1000mg for the first 3 days. After that drop to 3000mg a day…..ain’t been sick with no flu in 15 years. Do NOT get that flu girl!! By the way we are now (once again) in your neighborhood. Hanging around American Girl Mine enjoying the cooooold weather (!?). Not stalking you, I swear!!! Welcome to the neighborhood! I was over at American Girl Mine until the OHVers drove me out . . . but that was around New Year’s when it was warmer. I don’t think you’ll be bothered now. You missed the dust storm! I got thre flu shot and I think I had the flu from it. My husband got the shot yesterday and the pharmacist told him that they were giving the senior citizens a higher dose. It is nice here in Jacksonville Fl. 82 yesterday. Read and enjoy your blog every day. That’s interesting. That’s the first I’ve heard of seniors getting zapped with a higher dose. Oh my, 82 degrees sure does sound nice . . .
29 last night in Surprise and forecasting 22 tonight. All my trees covered and my hummingbird feeder is on the winter mix. Hummers that stay here year round are the Anna Hummingbird and they go into a sort of hibernation at night to save energy. They need more nectar and the mix for cold winter is 1 part sugar to 3 parts water (instead of 4 to 1). BTW sugar water freezes at lower temps than plain water. My birdbath froze a 1/2 in of ice last night but I had a 60 watt light bulb about 6 inches from the feeder so it did not freeze. I also had to wrap my outside pipes to prevent freezing. Arizona homes are not built for real cold weather. Also the senior flu shot is 4 times stronger than the shots for young folks. Reason is our immune systems are not as strong and the flu can kill us. I get the shot and avoid people as much as possible now. Stay warm Sue. My flu shot was the 4 times stronger this year too; in the past it has been regular dosage even though I told them I was OLD (over 70 now). Keep warm you guys. Glad you got the shot, Emily. I hope I don’t end up regretting that I didn’t. I have water out for the birds and chipmunks. I didn’t know that about a more concentrated winter solution for hummingbirds. I’ll add more sugar. You stay warm, too. My doctor said I can come in for a ‘follow-up’ flu shot this year. I’m going to do that tomorrow! It’s bad here and people are told to avoid hospitals, and doctor’s waiting rooms are separated into ‘well patients’ and ‘patients with fevers/coughing’ for separate rooms/areas. My doctor has his exam rooms designated as ‘flu symptomatic’ and ‘well-patient visits’ to help prevent cross-contamination. Simple diagnosis and prescription refills are by phone only. This is looking like a bad year in the south, for sure. I don’t remember what part of Texas you are in. Wherever you are, I hope you stay healthy through all this. Your doctor is wise. I actually had my ‘real’ shot in October, but because I volunteer at a senior citizen center, he warned me to be extra cautious, and said that some people need a second injection. I had the flu once, and I’d do (almost) anything to avoid ending up in the hospital. You be very careful, because the fur-babies don’t need to learn any nursing skills!! LOL I fear the people I don’t ‘know’ more than those I can FIND after I recover!! Pat in Ajo, for now. According to the reports I read, Ajo is a lot colder than it was last year. I’d be there right now if it weren’t for the cold. Love youf blogs even if its about puttering around the house….puts me right there at your door step. Of course I love to hear what the canines are up to…they make me laugh. Have a great day!! Same to you, Rita! This blog is about the life of me and my crew. If it’s a puttering day, that’s what I write about! Hey Sue, hope you are still feeling good. It has been in the high 60’s here in Northeast Mississippi for a few days and everyone has been outside. It is suppose to rain for the next few days and the temps are going to drop tremendously. That is when everyone gets sick!!!! I truly believe that if you wrote about watching paint dry, you could make it interesting! I hope no one gets sick. I’ve been wondering how all of you are doing. California, at present, has one of the lowest incidences of flu, but not so in Mississippi. Stay home whenever you can avoid going out. Thanks for the compliment, Pauline. Happy to hear the “bug” didn’t get you. I love the sunrises and sunsets I saw when we were at Pilot Knob. Looking forward to the day we can come back. Desert sunrises and sunsets are the best! BTW, I appreciate you including your location. Well, you got all the stuff you needed for the flu so you had to get it so things didn’t go to waste. Actually, the way things work with me . . . If I don’t have the stuff I need to live through the flu, then I’ll get it. If I’m prepared, I don’t. That’s my theory and I’m sticking to it! Sort of like the relationship between washing one’s vehicle and whether it rains or not. Love it– “I’m staying away from people for as long as I can manage it.”! I’m in 100% agreement (as far as the flu and all the other germs go)!!! Truth be told, that’s my modus operandi all year long! Read your articles every time they’re up. Always enjoy each and every one. Thanks..You could write a book you know. You’re good with words and description adjectives and painting a picture of what’s going on. Talented you are for sure. Thank you, Joe. I appreciate that nice compliment. Glad you enjoy my blog. Your adjustments worked! Your blog loads quickly now. Thanks! You’re welcome, Cherie! Glad to hear it. That is so true. I didn’t notice if the Wal-Mart I went to in Yuma had an outside window for pharmacy, which is a great alternative. In any case, loads of people were inside lined up with their prescriptions. I heard someone cough and raced out of there! Both Bridget and Spike love to luxuriate. With Spike, it’s soaking. He also loves it when I wrap him in covers after he’s done with his outside routine and his breakfast. But first thing in the morning, he’s a man with a mission! Bridget is a sleepyhead every morning. Glad your feeling well now ! I also do the hand washing and hand sanitizer thing multiple times a day even though I don’t hang with crowds viruses can stay alive on surfaces for a long, long time, I use a sanitizer wipe on the shopping cart I use at Wally World or grocery store. An once of prevention is worth a pound of cure-as the old saying goes. Using a hand sanitizer is very wise. I’m not a germ a phobe . But it is nice to remind people that money is the most filthiest disease carrying thing we handle on a daily bases. And most don’t think twice about it. Good example : think of all the times people go through a McDonald’s drive thru buy their food make change in handling money. Then reach right into the bag for their burger or french Fires , and not even thinking twice about.. I appreciate the reminder, Dominick. Congratulations, Jack! I admit I’m an amateur full-time RV person and wouldn’t attempt to camp in 12-degree weather. If you can handle that, good for you! Sue, I have to disagree. You are not an ‘amateur’ full-timer. You have proven to be a ‘Pro’ for sure! In the time you have been living in your Casita, you have proven to be able to manage any situation you have encountered. You may not choose to camp in 12 degree weather but if you were suddenly faced with it you would survive. Your “can-do” attitude makes you a PRO!! Thank you, Becky. That’s sweet. Love your last line . . .
Beautiful picture of the sunrise. Glad you didn’t catch the bug at Walmart. Bridget looks so precious. Good that you gave your body a rest. With a break in the weather we too headed to town. We picked you up one of those handsanitzer that clip onto the strap of your purse, a refill and some EnergyC 1000mg of Vit C drink packets. It’s kind of like that stuff called Airborne but better. Couldn’t believe all the people hacking, hewing and snotting while we were there. Grabbed our groceries and headed back into the woods. I’m unfamiliar with the EnergyC drink packets. I’ll look into that, online, not in person! I hope you both stay healthy through this siege. Yeah, Wal-Mart is probably one of the worst places to be these days, especially the pharmacy area. Wash your produce (especially loose tomatoes) very well as it is often handled by several people before you put it in your shopping cart. Opps I gave you the wrong name…its Emergen-C….are you familiar with Airborne? It’s just 1000mg of Vit C..Airborne is like Alkaseltzer tablets..bubbly up your nose when you drink it…taste like crap. Emergen C is like cool aid …no fizz. Same ingredients…different mode of getting it down the hatch. No, I’ve never heard of either. Thank you for the link! Wikieup AZ is realing from this sickness. I have this flu and it is awful. This is the 5th day and I feel terrible. I hope this isn’t the beginning of a pandemic. Back around World War One the flu wiped out people left and right. People were running for the hills as no one knew anything about this awful sickness. I think it was called the Spanish Influenza. Is history repeating itself once again? My advice is to book passage on a swanky cruise ship and head for the South Pacific. Don’t come back until the coast is clear. Better yet fly down under and if you hear someone in line cough. Run to another line with your gas mask safely in place. Oh Joe, no! Sorry to hear you are another victim of the virus. I’ve heard it lasts from five to seven days. I hope you are much better as you read this. I don’t know about being on a ship. I’d rather be alone in the desert in one of the warmest places in the Southwest. Speaking of gas masks…. I think if I had to go back to Wal-Mart, I’d want to wear a mask over my nose and mouth! That’s what the greeters should give people as they go in. Your posts are loading much quicker. Thanks for making the change. You’re welcome, Vicki! And thanks to Gary for pointing out the problem . . .
You’re welcome! Okay, about that day . . .It wasn’t a messy parking job. It was really a very slick, precise backing move on my part. 🙂 The problem was the guy getting upset that I didn’t park HIS way, following HIS hand signals. He didn’t think I could maneuver out of there in one backing. Ha! I guess I showed him! The “thing” removed from my nose was skin cancer, only a small spot but, boy, am I glad it’s gone. We fair-skinned, blue-eyed redheads (even the ones who are now grayheads) need to be vigilant about skin cancer. Yes, Zane Grey is very descriptive. I’m reading the classic Riders of the Purple Sage. It’s all the more real, now that I’ve been to southern Utah. Yes, thank you. It loaded much faster. Glad you don’t have the flu. And be sure to stay away from places like Wally World if you didn’t get a flu shot. You’ve got to be careful until the end of February, at the least. An excuse to be a recluse… I love it! You be careful, too, and stay healthy. I have been hitting the vitamin c really heavy for awhile hoping it works for me like it does for Billy Bob. And some orange juice to wash it down! Stay well Miss Sue! Hi Jeff… That’s one thing I forgot to get… Vitamin C. Doh. I hope it works for you and keeps you healthy. I have not seen any problem with the time it take for your website to open. I just thought it was my internet. On my desk top it seems quicker this morning, so I will check on my lap top later today. Enjoy the cool weather according to the weather people one say’s it will rain tonight and into tomorrow and according to the other they say it’s going to warm up in the next couple of days. Go figure….all I know is my joints are stiff. All I know is at the present time 0805hrs the current temp at NAS Fallon NV it’s -2 F and I am very glad that I am in San Diego. Have a great day! I’ve noticed the forecasts for Yuma/southern Cal don’t seem to be very reliable. I’m glad, too, that we’re not experiencing what most of the country is going through right now. I still haven’t turned on my heater! Right now it’s 22F @NASFallon, 25f@Reno 55f@MCAS Yuma and 42f@Chula Vista. The meteorologist here in Phoenix said this morning (Sunday) that Yuma was the only weather reporting station in Arizona that was not in the 20’s or below. At 30 degrees, you are the warmest in the state! Hi Eileen! That’s why we’re still here! Thanks Sue. All’s well now except my bruised feelings that I received while trying to help you by stating an obviously unknown problem to you and many others it appears. I see that I wasn’t the only one with the problem and I suspect there were many others that haven’t commented about it. Bruised feelings? Did I do that? If so, I’m sorry. I’ve pulled up all my responses to you, but I don’t see anything hurtful. But who knows . . . with the printed word, intent is sometimes lost! I’m actually grateful (that’s why I thanked you) that you took the time to bring up the slow-loading issue. Apparently others were experiencing the same problem, some for two weeks. If you hadn’t pointed it out to me, I wouldn’t have known there was a problem. So thanks again, Gary! No not you Sue, others that wanted you to show me the door and acted as if I was nit picking or outright lying because they didn’t have the problem. Gary appears to bruise easily. Not only that Ed, I find I’m leaving the toilet seat up more than not. My eyelashes have gotten shorter over time. My eyes fill right up if I see an advertisement for a chick flick. I’m afraid to watch a chick flick I actually bawled the other day when I heard Tammy sing ‘Stand by your man’! I’m fairly convinced I’m a victim of feminist anti male attitudes, or I’m suffering from low T.
Your site is loading faster for us also, here at Fortuna Ponds. We didn’t make it to Wickenburg. The flu? On no! Do we dare go shopping? No shots for me. Last time I got a flu shot I couldn’t move for a week. You’re at the Pond! So close! I’ll email you right away . . .
Good morning from Tucson AZ where it was 21 degrees last night. Thanks for the tweak, Firefox memory usage has returned to normal when I load the blog. It’s now back to being fast. Great! Uh, the fast loading is great, not 21 degrees! Thanks for letting me know, Allison. Hey Sue–glad all is well. Here in Tennessee we had 70 degree weather yesterday, today there are flood warnings and 40 degrees and a wee chance of snow tonight and tomorrow. I asked a question on yesterday’s blog; I hope you don’t mind if I as again. I know your read lots–are most of your books on Kindle or do you travel with hardbacks/paperbacks? Just curious as to storage. Still 66 in Spencer; guess the cold is rolling east. Hi Mick! Nice to hear from you. A few minutes ago I was outside talking with an RVing neighbor and listening to compliments on my antenna and solar panel/tilt mechanism . . .
Glad you’re having relatively mild weather. Hi DeAnne…. That’s so funny. I was looking all over for the comment where someone asked about paperbacks and I couldn’t find it! I’m glad you asked again. Most of my books are on kindle. I do have a drawer in the BLT which is full of paperbacks right now, most of them given to me by another RVer when we camped at Borrego Springs. I have that one deep drawer designated for books. When it’s full I don’t pick up any more (from thrift stores… I never buy new books.) or I give away as many as I buy. If I didn’t restrict myself to that one drawer, I’d probably collect too many and be up to my armpits in books. People say they don’t want a kindle (or other ereader) because they like the feel of a book in their hands. Well, you can still have paper books! But with a kindle you get FREE books and you can store hundreds of books, so you never find yourself with nothing to read. Thanks Sue. I had assumed that, but you know what they say about that word! I have been enjoying many books that are free on Kindle. And there are many Zane Gray if not all. Right now I am really enjoying a book about a businessman who goes to China. Not something I normally read, but pretty good. If interested, it’s called “The Dark Horse of Shanghai” if you are looking for a change of pace. I also love to shop at Dollar Tree (everything’s a dollar!) and buy books. But like you, I give them to Salvation Army when done. It’s going to be -5 tonight in SLC, UT. Going to be a cold one. Love your sunrise.i look out the windows and see the neighbors houses. Can’t wait for my time to full time it. Until then I very much enjoy your travels and pictures. yep, that adjustment sure did help with the down load. Thanks,!